It's far too long since I joined in with #MySundayPhoto and even longer since I did a linky at all so here goes. 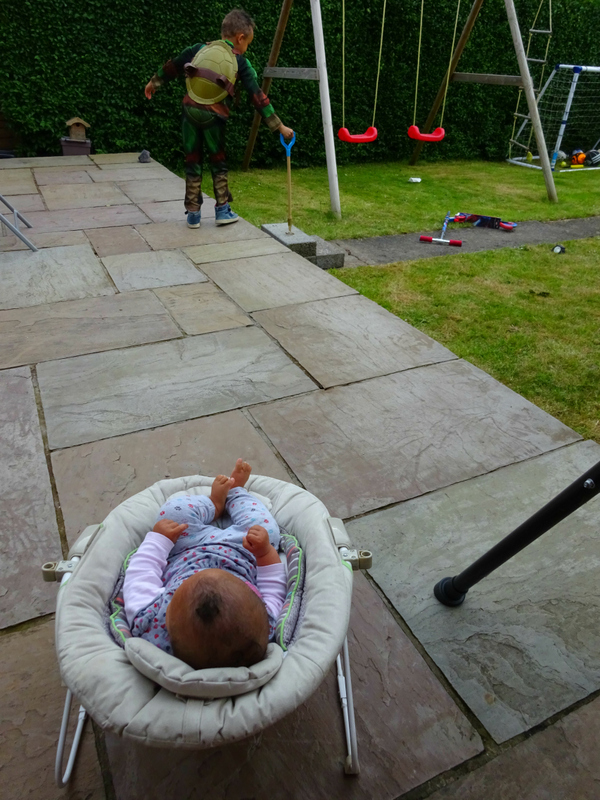 It wasn't as warm today as this past week, but that was actually a relief as it has been so so incredibly hot/humid all week and it's been tricky for the baby. She wakes frequently at night, I think due to thirst. The Gro Egg tells me it is 24 degrees in the bedroom. So today we enjoyed drop in temperature (after it had rained heavy all night) and spent the afternoon in the garden. I actually cut his hair today. It's been long for over a week but we've lost my hair scissors. I have #PampersBabyDry to thank for this cut as the scissors they have sent us in the set are sharp enough to cut hair so today, that I did. Must be the fifth time I've cut it this year. It seems like a lifetime ago when I look at his hair pre short back and sides. And you know what, it is a lifetime ago! Lottie's life! As he still had a full head of curls when she was born. It's like having a baby released him from his obligation to be my baby and I felt able to cut his hair. When he was my one and only, I thought he was so so little, I couldn't possibly have done it or said goodbye to his curls. Now, on the flipside I look at his hair pre haircuts and think oh my God it is so so long! You couldn't have told me that then though. Oh no, you would have got a tongue lashing for your trouble. My boy WAS his curls. But now, no! I can see my boy above and beyond his curls and the token ones on top are enough for me and for him. 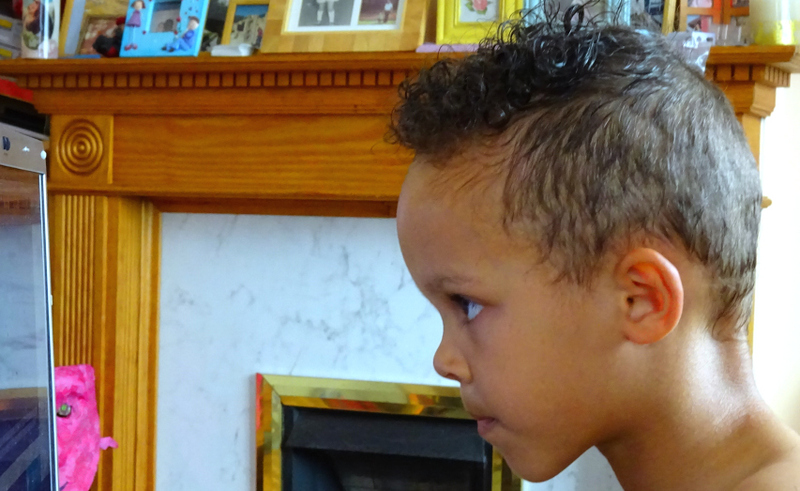 We both love his new hairstyle and of course so does Daddy given that it's a mirror image of his own, not that I cut his. Funny as for years he's been holding down Aaron's curls on the side, saying "let me see your face" and "how would you look without your afro?" Well now we know. Very handsome I think! I am having post partum hair loss and it's been a couple of weeks now. When my hair is in a pony tail it is about a third of the circumference it used to be. It had thickened SO much in pregnancy but now it's quite the opposite. I lose handfulls in the shower and again handfulls more when combing it. It's awful and I am wondering will I be needing a wig in a couple of weeks. The Dyson is FULL of it and I always have a couple of spare hairs tickling each arm and as I start to breastfeed there are always a couple in her way that I have to move in case she's swallow them. Having a hair in your mouth is bad enough as an adult when you can deal with it and tell people what's wrong. I am taking supplements so I don't know the reason for it other than I have just had a baby. I remember having it with Aaron and can't remember when and if it stops. I eventually thickened up my hair again that time with Chinese Herbs but I'd say there won't be a budget for them this time. So Aaron's had a haircut and the two ladies of the house are losing ours. Ah well. He's COVERED the sitting room floor in toys, somehow, despite us spending so long in the garden and I can't face picking them all up. They're both asleep and we have a birthday party early tomorrow. I really should get off this computer and try to face them. Tidying..... pah! I'm just back 23:45 for the third time breastfeeding her back to sleep whilst typing this post and they've only been in bed since 21:15. The Gro Egg says the room is 24 degrees even though it was cooler today. I think also though, that she senses I am not up there in the bed beside the cot so I think I'll call it a night. Aaron looks like a proper hero in a half-shell. I love that first photo of him in mid-air - a perfectly timed capture! 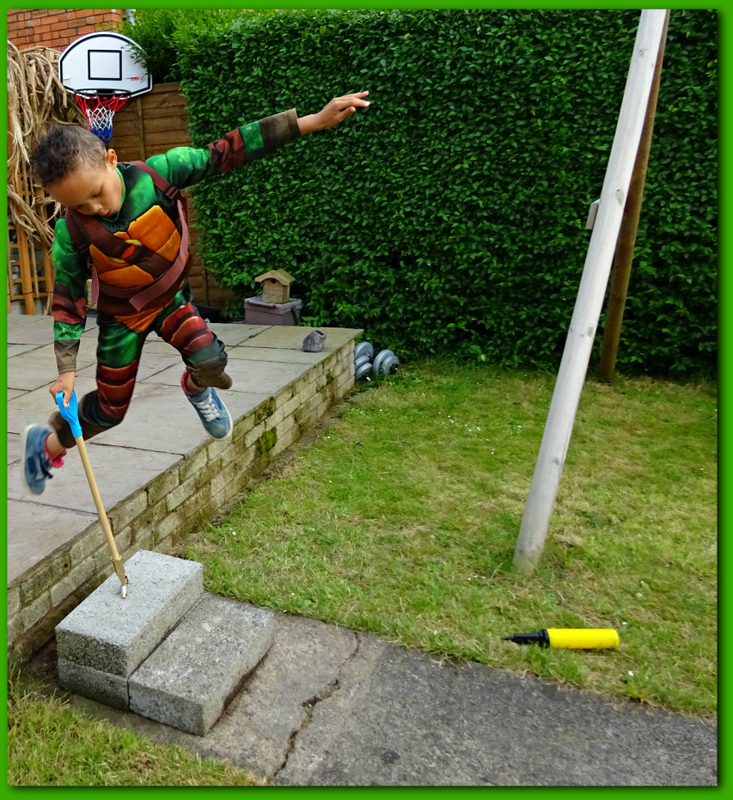 some great action shots of your Ninja turtle! Its always lovely to get out in the garden. Aaron looks very handsome with his new hair cut! Beautiful photos, I love the first photo. It's so nice to be able to get out and enjoy the garden. Love that first photo. He looks like he's flying! It's great that his sister enjoys watching him. Fingers crossed the age gap isn't an issue for you all. 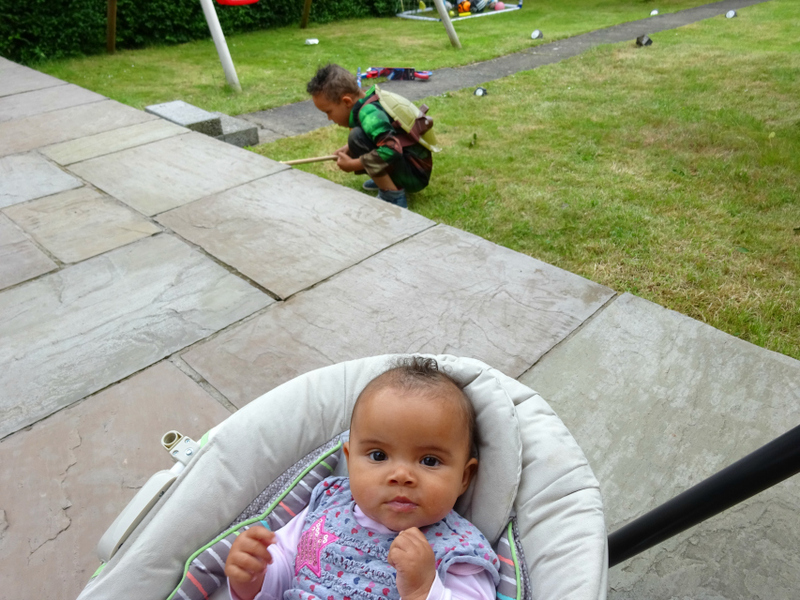 There's just under five years between my eldest and my daughter and I find it a real struggle, but they have a brother in between, which makes it a different dynamic. Ahh! 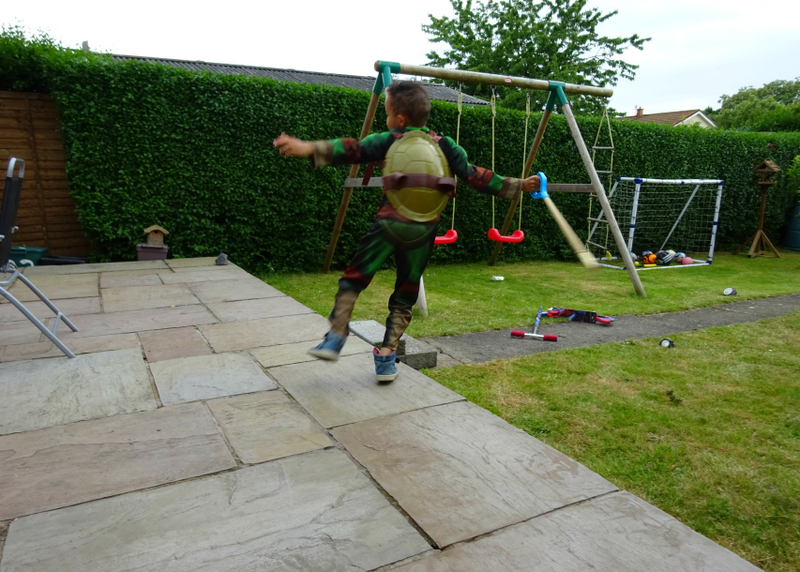 I love Aaron's turtle costume! He looks like he's having a great time. There is just over 5 years between my girls and my eldest is 13 and they still get along great but there is moments when my teen wants to be a teen. It isn't really an issue. I have an almost 5 year gap between my 2 and so far, it isn't too bad. The love each other and I hope it continues. So cute how Aaron is loving his baby sister as an audience and how fast is she growing?? Gorgeous!